Is there something that’s more fun to do on a weekend than hunting for catfish? As you know, this species of fish is perhaps one of the hardest fighters in the waters. But when you manage to bring one home, the taste on the dinner table comes second to none. The following 7 rods are meant to help you make the most of this opportunity. As you’d expect, they come in different, colors, shapes, and sizes. With all those facts and factors in mind, we’d like to usher you into our exclusive review of what we believe are the best rods of catfish on the market. Don’t let the monstrous catfish intimidate you. The following comparison has all the rods you may need to subdue these powerful fighters. 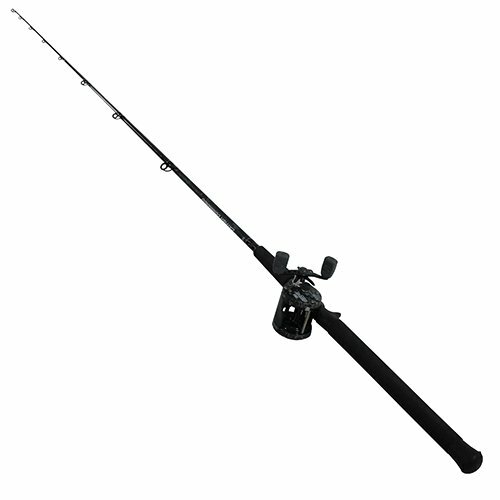 The Okuma-Battle Catfish rod will give you an edge in the sport of catfishing. It is a product of Okuma, a renowned company in this realm. 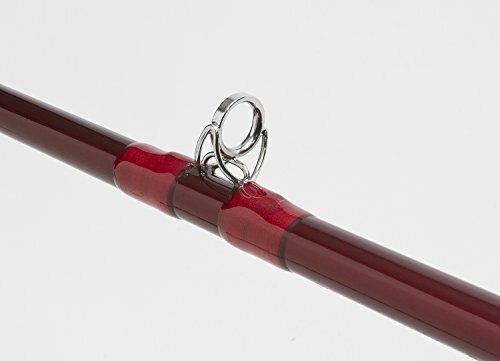 The rod features a powerful and durable E-Glass rod blank. It also has EVA fore grips to reduce hand fatigue and keep you catfishing for extended periods of time. Besides that, it has a Cork rear grip to keep you in control of the rod. The rod, further, comes with guides that are double foot welded stainless steel. In addition, the hook keeper is made of stainless steel and heavy-duty material. It is a two-piece rod, therefore more convenient to carry or store. On the flipside, though, this rod is a bit pricey. There are three models with different lengths to choose from. The lengths are 7 feet 6 inches, 8 feet, and 10 feet. The three lengths are priced differently. Rippin Lips-Catfishing Spinning Rod is a rod that can suit newbie anglers and seasoned anglers alike. It is a special catfishing design by master cat man John Jamison that can be used for bottom fishing, dragging, bumping or hanging. The Rippin Lips-Catfishing series are all cheap catfish rods and suitable for an angler on a budget. There are six lengths to choose from all with different features. Though it is one piece and therefore a bit cumbersome to take on a trip, the rod has many remarkable features to meet your catfishing needs, helping you catch cat after cat. The concept behind the design of the rods is for the tip to be visible at all times so that a catfish bite can never be missed, and therefore the tip glows. Other design concepts include a special body and guides. The rod is manufactured using a material dubbed SuperCat glass. SuperCat glass is a light but strong material. It is a blend of S-glass, E-glass and graphite blank. The guides are stainless steel, chrome-plated while the guide wraps are epoxy-coated. If you are starting out in fishing, you need to match the rod with a good reel to achieve an overall good fishing experience. It is a one-piece and therefore not so portable like detachable rods. Abu Garcia-Catfishing Commando Combo is a good deal if you are a newbie catfish angler and have no fishing gear. The combo will save you the hassle of buying a reel separately. Both the rod and reel are specially designed for catfishing. 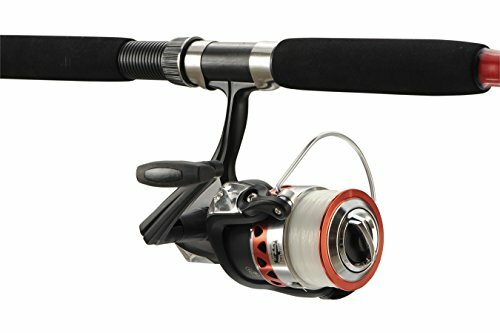 Because you get a reel and rod, the price is in the medium range. 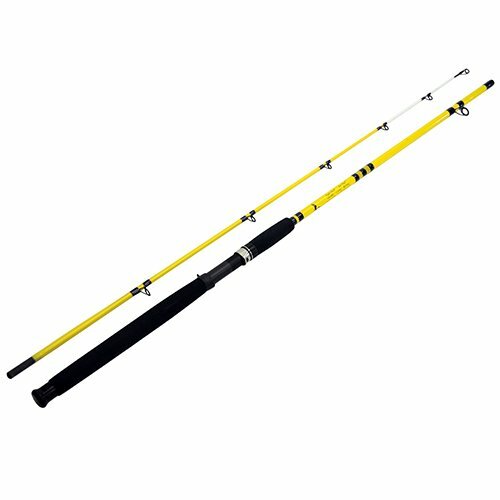 The rod is 7 feet, medium heavy power with a blank construction for durability and high-sensitivity. The reel, on the other hand, is constructed to be smooth. It has an ergonomic design to ensure your hands stay comfortable and don’t get fatigued. In addition, the reel has two stainless steel ball bearings and a gear ratio of 5.1:1. The reel comes with a Carbon Matrix drag system which provides a smooth and consistent drag. Besides that, the reel has a six-pin centrifugal brake design to do away with backlashes. Rippin Lips-Catfishing Casting Rod is uniquely designed with special features that you won’t find in other rods. It is a rod specifically designed for serious catfishing. The rods were specially designed for catfishing by John Jamison, a master cat man. He designed six lengths. The rod is 7 feet and 6 inches, with medium heavy power. In addition, it has a blank construction. SuperCat glass technology is the special material used in the construction of the rods. It is a blend of S-Glass, E-glass and graphite blank. The material is light, yet strong. The guides are heavier than standard guides and are extra hard, chrome plated and stainless steel. The guides come with epoxy-coated wraps for protection and strength. Besides that, the casting rod has an EVA split grip handle to put you in control when catfishing. The tip of the rod glows easy monitoring of fish bites, even at night. The other good thing with the rod is that they are affordably priced. They are one-piece and more cumbersome to transport than detachable rods. Eagle Claw-Catclaw Casting Rod is a two-piece rod constructed specifically for catfishing. The rod is manufactured by Eagle Claw, a company that specializes in manufacturing fishing gear. The rod is designed to be ultra-sensitive, durable and strong. 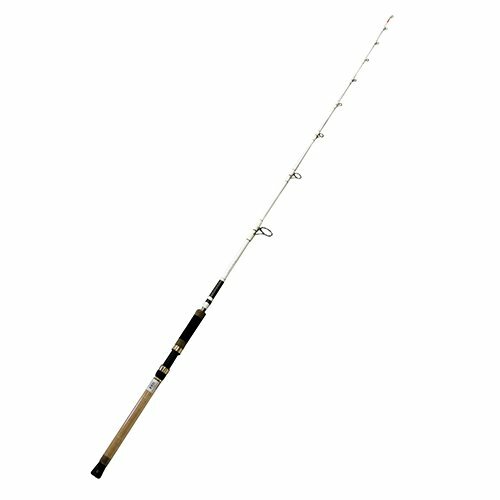 The medium-heavy, 8' long rod has enough power to catch big catfishes. Because it is a two-piece rod, it is easy to carry it and also store it. The rod is also quite affordable, making this rod a budget rod. The handle is EVA foam for your comfort, especially when battling big cats. The rod is a 100% fiberglass rod with a graphite reel seat. It has 6+1 guides made from aluminum oxide. The design of the guides will reduce the wear and tear of lines while improving your casting distance at the same time. Ardent Catfishing Spinning Combo is a great combination to buy if you are on a budget or you are looking for convenience. You get to shop and purchase the rod and reel at the same time, at a very reasonable price. The reel is a 5000 size spinning reel with a gear ratio of 5.5:1. It comes with 3 Ball bearings. The frame is graphite and therefore lightweight. The rod, on the other hand, is a medium-heavy 7 feet and 6 inches action spinning rod. The rod has a fiberglass construction with EVA handles and aluminum oxide guides. It is two-pieces construction and therefore quite convenient to travel with it or store it. 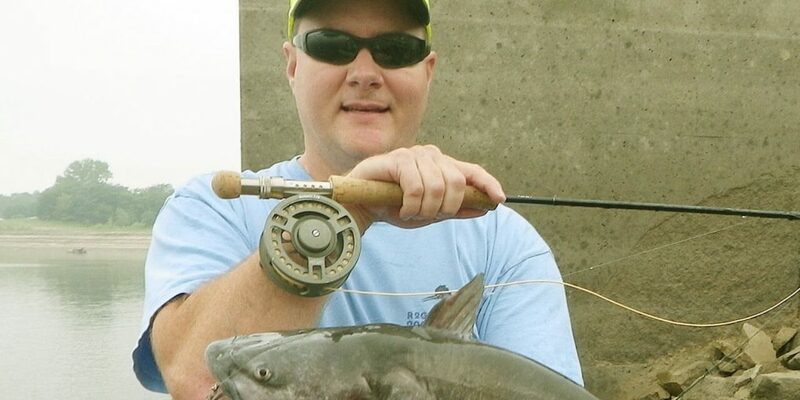 The rod and reel have great features making a good catfishing combination. Rippin Lips-8 Feet Catfishing Casting Rod is a heavy duty rod specially designed to handle monstrous catfishes. It is a one piece rod. This series of rods (featuring six) are the brainwork of John Jamison who is a master cat man. The rods have a SuperCat glass material - a blend of three materials namely graphite blank, S-Glass, and E-Glass. The result is a light and strong rod. The tip of the rod glows indicating tracking fish bites even during night fishing. The rod comes with an EVA split grip handle to put you in total control when you are battling monster cats. The steel guides are extra hard, stainless steel chrome plated. In addition, the guide wraps are epoxy coated. Besides that, the rod comes at a very reasonable price. You can actually afford to buy all the series because of the affordability of the rods. A bit inconveniencing to carry and store it because it is a one-piece. Shopping for catfish rods may sound like a complicated task especially if this is your first time looking for them. But no matter what, always keep in mind the fact that this type of fish comes with its specific needs. As noted earlier, catfish are notorious for withstanding long battles. A light power action rod may not live to see you bring that catch home. So, here are the key features to keep in mind at all times. We generally recommend going for longer handles as these increase the rod’s overall control and strength. This also provides you with a great degree of power not to mention versatility. So, no matter your style of fishing, you can always have an easy time handling long lengths. The 6 or 7-inch rod length is, in our opinion, the best fit for this particular kind of fish. There are different types of catfish angling styles and so, there really isn’t a one-size-fits-all rod. But generally, we do recommend medium power rods for anyone who may not be sure of what they want. While at it, keep mind that fast action rods are designed to flex toward the tip. Slow action rods, on the other hand, are meant to flex throughout the rod length. The best action for catfish rods is the slow one as it allows for an enhanced level of control. The kind of catfish you’re targeting should also influence the kind of rod you invest in. For instance, if you’re going for the Channel catfish, a medium power rod would be fine. However, if targeting the flathead and blue catfish, your safest bet would be with the medium-heavy or heavy-power rods. Whether you’re shopping for the most popular catfish rod under 50 or simply target the best quality (but pricey) variety available matters. You can choose to go for the cheapest rod available if you want to try this style of fishing for a short time. However, if you’re planning to go big on catfish angling, we’d recommend going for one of the premium-grade rods available. As you can see, there’s every reason to go for the best-made rod. To this end, our favorite would have to be the Abu Garcia-Catfishing Commando Combo Fishing Rod and Reel. It has the ideal length of 7-inches and comes with a reel. It’s generally well-built and handy for beginners and experienced anglers alike. It’s no wonder it won the attention of our selective editors. Pound-for-pound, fighting catfish requires nothing short of an excellent rod. But provided you have the right unit with you, these hard-fighting fish can make for a great day on the waters.